NOTE: The AfT gear position indicator panel light harness and the park pin switch are not available separately. Replace the A/T gear position indicator panel light harness and the park pin switch as a set. 2. 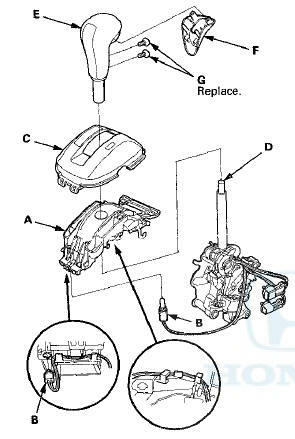 Remove the shift lever assembly (see page 14-222). 3. Wrap the end of a flat-tip screwdriver with tape, pry the shift lever knob cover locks, then remove the shift lever knob cover (A). 4. 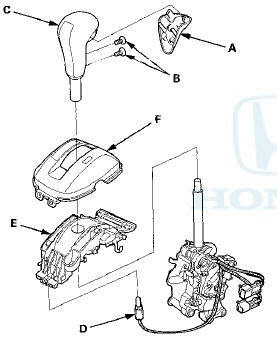 Remove the screws (B), and remove the shift lever knob (C) from the shift lever. 5. Remove the A/T gear position indicator panel light socket (D) from the indicator panel base (E). 6. Remove the AfT gear position indicator panel light harness from the harness guides of the indicator panel base. 7. Remove the AfT gear position indicator panel base, then disassemble the indicator panel (F) and the indicator panel base. 8. Release the lock (A) of the shift lock release, and remove the shift lock release and the release spring (B). (B), and remove the light bulb (C) from the socket. 10. Remove the park pin switch/A/T gear position indicator panel light harness (D). 11. Install a new park pin switch/A/T gear position indicator panel light harness, and secure the park pin switch with a new screw. 12. Tie the park pin switch/A/T gear position indicator panel light harness and the shift lock solenoid harness at the guide with the a new harness wire tie. 13. Install the A/T gear position indicator panel light bulb in the socket. 14. Install the release spring (A) in the shift lock release (B). 15. Install the shift lock release and the release spring on the release shaft end. in the shift lock release (B), and the hooked end (C) is on the stop (D). 17. Install the A/T gear position indicator panel base (A). 19. Install the A/T gear position indicator panel light socket (B) in the indicator panel base. 20. Install the A/T gear position indicator panel (C). 21. Apply silicone grease to the top (D) of the shift lever rod. N O T E : Make sure not to get any silicone grease on the terminal part of the connectors and switches, especially if you have silicone grease on your hands or gloves. 22. Install the shift lever knob (E) over the shift lever. 23. Install the shift lever knob cover (F) on the shift lever knob with new screws (G). 24. 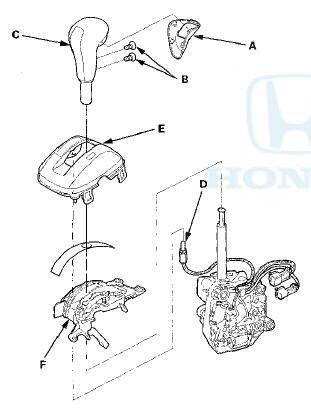 Install the shift lever assembly (see page 14-224). 25. Install the center console (see page 20-158). NOTE: The A/T gear position indicator panel light harness and the park pin switch are not available separately. Replace the A/T gear position indicator panel light harness and the park pin switch as a set. 5. Remove the A/T gear position indicator panel light socket (D) from the indicator panel (E). 6. Remove the A/T gear position indicator panel light harness from the harness guides of the indicator panel base. 7. Remove the A/T gear position indicator panel base (F), then disassemble the indicator panel and the indicator panel base. 8. Remove the light bulb (A) from the socket. 9. 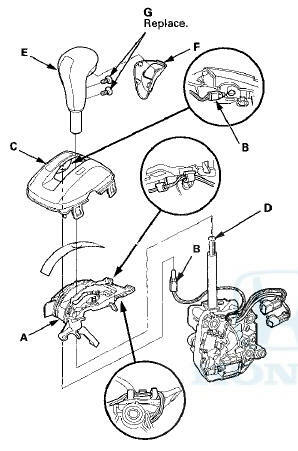 Remove the park pin switch/A/T gear position indicator panel light harness (B) and the shift lock solenoid harness (C) from the harness guide (D). 10. Install a new park pin switch/A/T gear position indicator panel light harness. 11. Route the park pin switch/A/T gear position indicator panel light harness and the shift lock solenoid harness in the harness guide. 12. Install the A/T gear position indicator panel light bulb in the socket. 13. Install the A/T gear position indicator panel base (A). 14. Install the A/T gear position indicator panel light socket (B) through the indicator panel base hole, then install the socket in the indicator panel (C). 15. Route the park pin switch/A/T gear position indicator panel light harnesses. Take the slack out of the harnesses, and secure the harnesses in the harness guides. 16. Install the A/T gear position indicator panel. 17. Apply silicone grease to the top (D) of the shift lever rod. 18. Install the shift lever knob (E) over the shift lever. 19. Install the shift lever knob cover (F) on the shift lever knob with new screws (G). 20. Install the shift lever assembly (see page 14-224). 21. Install the center console (see page 20-158).